Ljutenica, Lyutenitsa or Lutenica is a spicy vegetable relish in Bulgarian, Macedonian and Serbian cuisines. The ingredients include peppers, carrots, eggplant, onion, garlic, black pepper, vegetable oil, sugar, salt, and may or may not include tomatoes. It comes in many varieties; smooth, with bits; with extra tomatoes or no tomatoes, peppers or eggplant; and spicy or mild. Ljutenica may be slightly hotter (spicier) than the other popular relish Ajvar. However, different regions and countries have substantially different interpretations of these relishes. Traditional Bulgarian Lyutenitsa is less hot than Ajvar. In Bulgaria, Lyutenitsa comes in a jar and is often used as a spread on toast and breads. It is also popularly eaten with many meats, meatballs and kebapcheta. Most households will have this in their house all year and it is a cherished favorite by many. 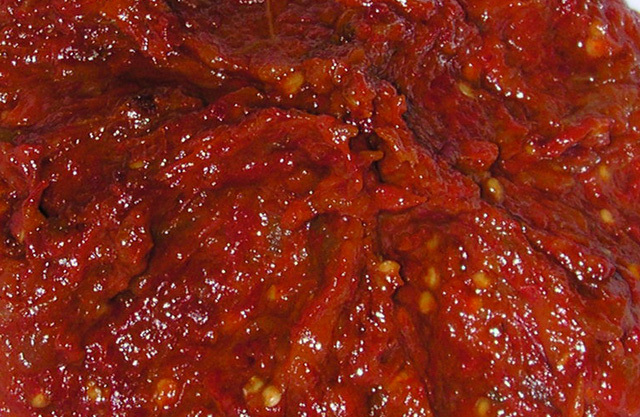 In recent years, industrial production of ljutenica, as well as ajvar, has flourished. A large scale production of both relishes has popularized them outside the Balkans. Recipe for Ljutenica see Here, Here and Here.